I love our family room and am so excited to share the full room reveal with you today! We spend a looooooot of time in this room. When we bought the house, this room was really dark. The walls had wood paneling, the patio doors weren’t there, and the windows had huge awnings on the outside, which blocked out a lot of natural light. The room is so bright and cozy now, and we love it! The walls are the same Sherwin Williams’ Camelback I have throughout most of the house – my favorite neutral paint color! I used a lot of red to accent this room. The black circle table and the silver lamp on top are also TJ Maxx finds. Kalen and I found the table in the downtown Cincinnati store, too. We had parked several blocks away and figured we could just carry the table to our car. It was a hot day, and this wasn’t the brightest idea. Maybe pull the car around when you come upon a fabulous find at TJ Maxx and it’s hot out! Whoops. Speaking of TJ Maxx, we also found these end tables there. They were already black with silver handles – perfect! And I love these lamps! They’re such a cool shape – and the rectangle lamp shades are fun! This black coffee table and matching ottomans are from HomeGoods. I’ve had these for years. They are perfect in any space. The coffee table lid has a tray on the underside, so it’s fun to flip it over for a different look every once in a while. The ottomans are great extra seating when we have a bunch of people over. I love this rug, too. The neutral colors go so well with the couch and walls. As for the wall decor, these pictures are from Bed Bath & Beyond. We had them in our kitchen in our Cincinnati house. 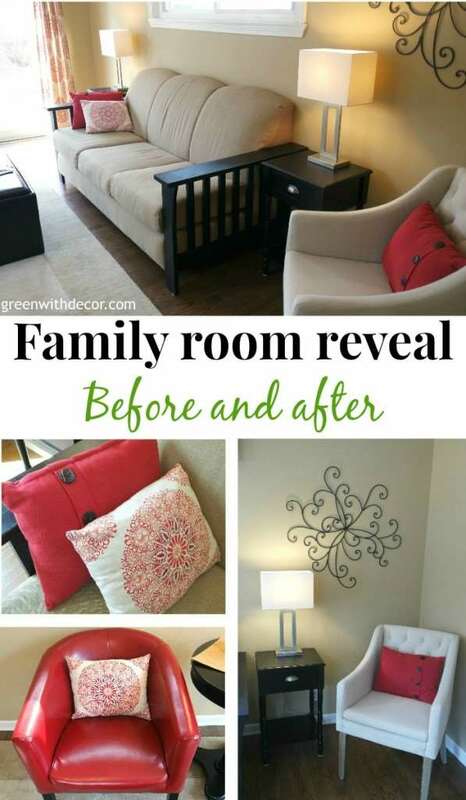 It’s fun using pieces in totally different rooms in different houses. The clock was another HomeGoods find. #Homegoodshappy, indeed. This black metal piece is perfect for this wall space. The chair is a fun, easy way to add extra seating to the room without having to deal with a big chair that overpowers the space. I love the red curtains near the patio doors. I bought extra so I could make the valances for the side windows. It was pretty easy. I made them the same way I made the valances in the kitchen. I love the fun buttons on these red pillows! And that’s the cozy family room. What’s your favorite room in your house? How do you decorate it? Looks great! I love the red chairs, curtains and pillows! I love that you have separate seating areas, it defines the space!! I am always amazed at what you have done, how long since you bought your home! ? WOW!! I love, love, LOVE the red!!! Isn’t TJ Maxx a Godsend?!! You did such an amazing job! Thanks, Chelsea! Love TJ Maxx!! Wow, what a difference! The room looks great! I esp love that Target lamp too. I’ve been working on my living room since we moved in pretty much, hope to have it done soon!! Thanks, April! 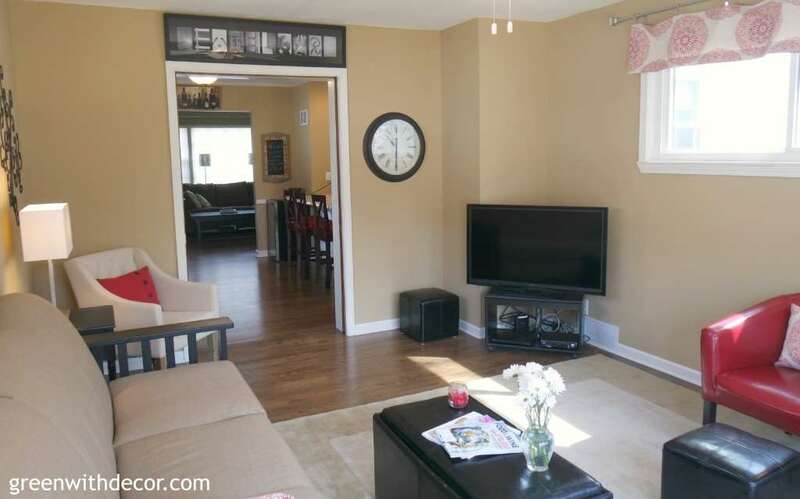 Good luck with your living room – can’t wait to see it all done! Wow! What a transformation!! It looks great! It’s so much more bright and beautiful! 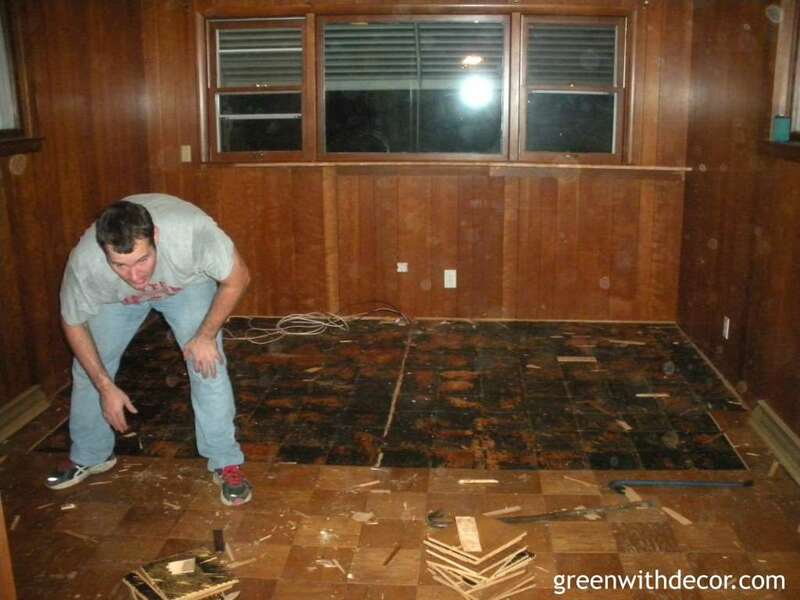 Did you remove the wood paneling yourself or did you hire out!? You did a great job on the transformation! Thanks, Ruthie! Yep, we did all the demo ourselves! Thanks, Tee! How nice to have an open concept to watch the kids! What a awesome room, I can totally imagine curling up on one of those red chairs with some hot coffee! Thanks, Bethany! Love curling up there with coffee! Gorgeous! I especially love the clock! Thanks, Roxanne! I’m so into clocks lately! Wow! Great job on the update, it doesn’t even look close to the same room in the before pictures! Hi, Meg ~ Amazing job on this room! I can’t believe how different it looks! I can see why you spend a ton of time here. :0) I love all of the seating…such a nice variety in color and style, but they all compliment each other. And that wall color is gorgeous! I’ll be looking that one up. Enjoy your “new” room! Thanks for sharing! This will be short and sweet…”OMG, IS THAT THE SAME ROOM?” —what a difference Meg. I love how bright and airy it looks!